When I went to Thailand, I knew I wanted to go to Chiang Mai. It was one of the places in Thailand that everyone told me I just had to visit, and it was a great place to explore after spending time on the beaches of Thailand. Chiang Mai is located in the north of Thailand, and is one of the cooler places in Thailand, temperature wise. Take that with a grain of salt, because cooler is all relative – Chiang Mai is about 25 celsius all year round, which is cooler than other areas of Thailand, but hey, it is still pretty darn warm there. 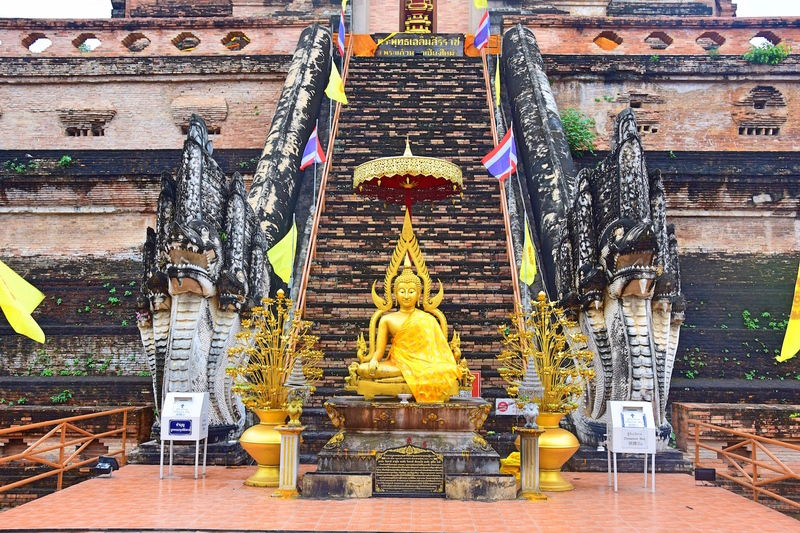 Chiang Mai is famous for its old town and all the temples that fill it. You practically can’t walk more than five minutes in the old town without coming across another temple. If you haven’t gotten your fair share of Buddhist temples in Thailand yet, then you certainly can in Chiang Mai. On your first day in Chiang Mai, I’d recommend checking out the temples first, and ticking those off of your list. 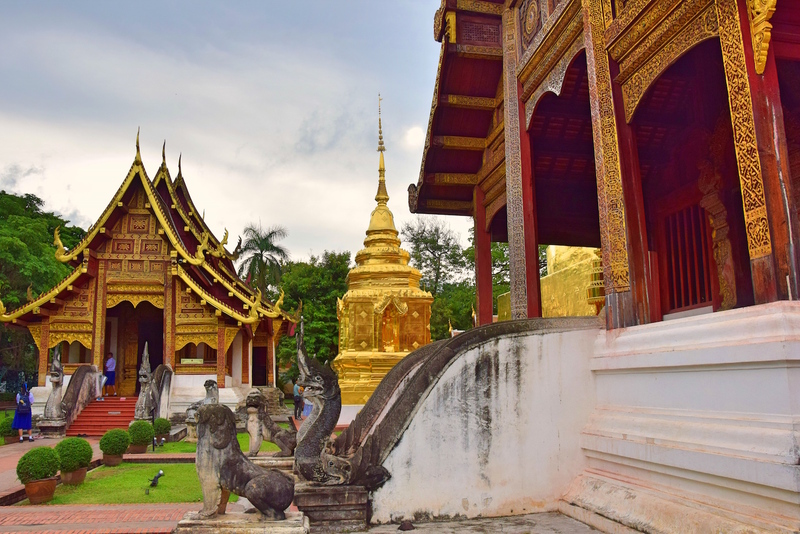 Though there are tons of temples you can explore, there are two in particular that I recommend visiting during your three days in Chiang Mai, Wat Phra Sing and Wat Chedi Luang. Wat Phra Sing is home to Chiang Mai’s most sacred sean style Buddha image, Phra Phutthasihing (if you’re not caught up on all the different types of Buddhas and their meanings, check out this website). Wat Phra Sing is located on Sam Lan Road, and is a great place to stop and reflect during your trip around Thailand, not to mention take beautiful pictures of this temple. Wat Chedi Luang is another wonderful temple to visit in Chiang Mai, and is a pretty impressive sight. The name Wat Chedi Luang actually means “large chedi” – the chedi is the large stupa in the middle of the temple grounds. 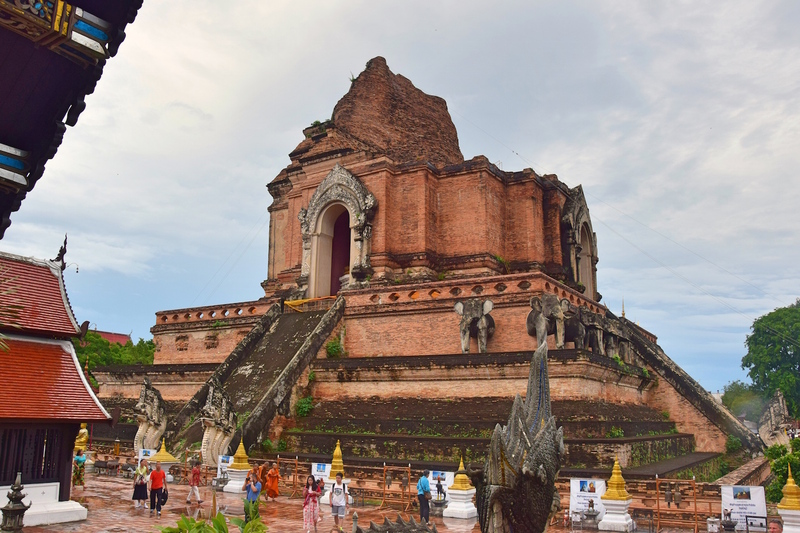 The original chedi was built in 1481 and rebuilt after the 1545 earthquake. Wat Chedi Luang was one of my favorite temples I visited in Thailand, and one of the primary Chiang Mai points of interest. After your visit to Wat Chedi Luang, I recommend sticking around the temple to take advantage of a Monk Chat. Monk Chats are an opportunity to interact with the Buddhist monks, and some people find them to be a spiritual experience. My experience was mainly interacting with the monks to help them practice their English, which was also fun, albeit not necessarily spiritual. One thing you should know is that Buddhist monks cannot touch you if you are a woman. I was a bit surprised to find out about this, and not only are they not allowed to touch you, but they aren’t allowed to touch something that you are also touching. Or at least, that’s how it was during my Monk Chat. I had my DSLR with me, and one of the monks told me he was also interested in photography. So, I tried to hand my camera to him, but he couldn’t take it from me. Instead, I had to set it down first so he could pick it up. Maybe this is common knowledge to everyone, but I had no idea that Buddhist monks had these types of rules. For more information on Monk Chats, check out this post. 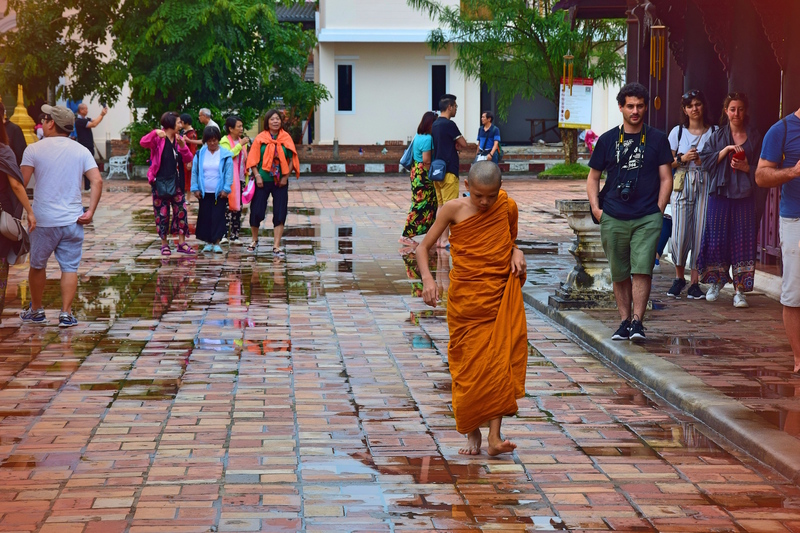 In my opinion, joining a monk chat is one of the best things to do during your 3 days in Chiang Mai. At the end of the first day of your 3 day Chiang Mai itinerary, I’d recommend checking out the boutiques around the the temples to do a little shopping, and grab some dinner at a place like Huen Phen that serves Northern Thai food. Elephant Nature Park was a big part of the reason why I wanted to visit Chiang Mai. I love animals, and love to do anything I can on a trip to be close to them in an ethical way. 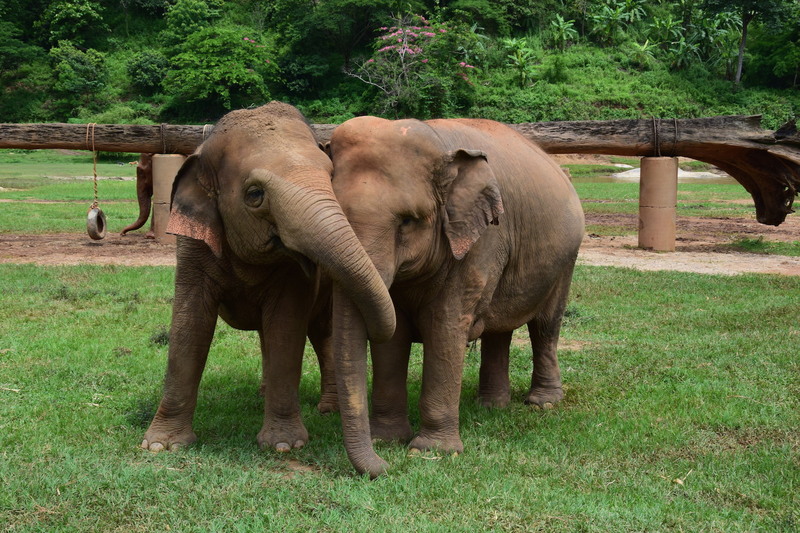 Elephant Nature Park is the best way to spend a day in Chiang Mai, and trust me, you won’t want to miss it. Elephant Nature Park is the first and most famous ethical elephant sanctuary in Thailand, and the team there does a spectacular job of educating tourists about why they should never ride an elephant, and providing ethical experiences instead. I recommend spending one full day at ENP – you’ll need an entire day to fully enjoy it, so choose a full day tour over the half day tour. 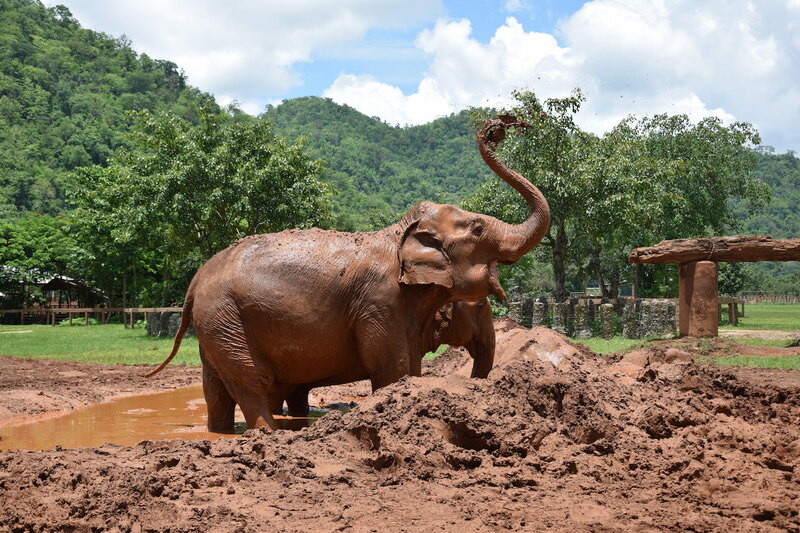 During your visit to Elephant Nature Park, you’ll get to feed the elephants snacks, observe them playing, bathing and just generally being elephants, and you’ll learn all about how ENP rehabilitates injured or sick elephants, and their inspiring rescue mission. Make sure to book ahead of time, Elephant Nature Park is pretty popular and reservations can fill up – you definitely don’t want to miss this as its one of the best day trips from Chiang Mai! 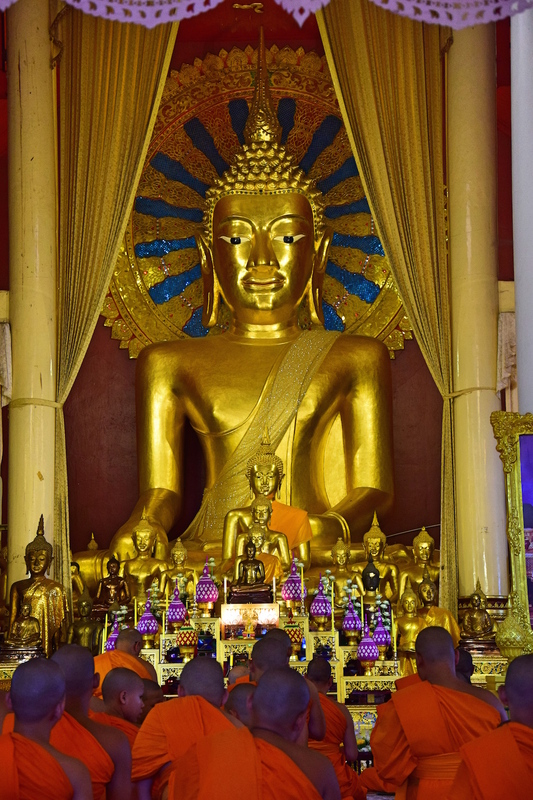 If you’re in doubt about going, let me tell you that this was one of the highlights of my entire three week trip to Thailand – it is an incredible and eye-opening experience. In the evening after your visit to Elephant Nature Park, head to the Chiang Mai Night Bazaar to check out all of the street vendors and grab some food. The Chiang Mai night market is located about a fifteen minute walk from the Old Town of Chiang Mai. The Chiang Mai Night Bazaar is a must-do on the list of things to do in Chiang Mai Thailand and is also a great spot if you’re looking for souvenirs or a trinket to bring home for friends or family. 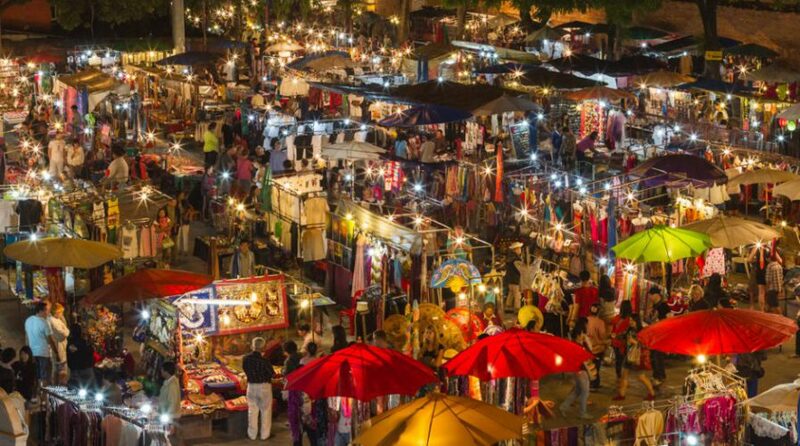 Wandering the Chiang Mai Night Bazaar is nearly endless with tons of vendors selling clothing, handicrafts, and more. 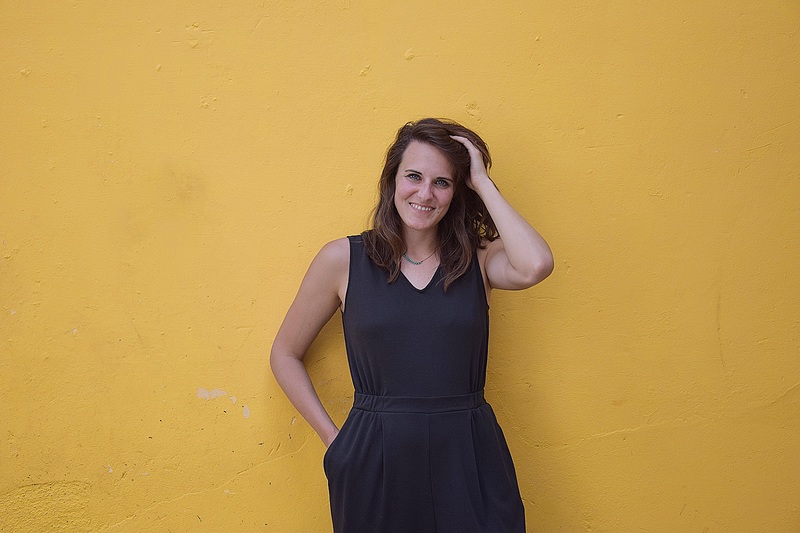 Some parts of it can feel a bit like a flea market, but its also a great stop for picking up backpacking clothes – I picked up to super cute rompers that I still wear all the time. Make sure to grab dinner from a nearby restaurant or street food vendor to soak up as much Thai food as possible during your three days in Chiang Mai. On your day in Chiang Mai, start the morning off by taking a songthaew up the hill to Doi Suthep (Wat Phra That Doi Suthep). If you don’t know already, a songthaew is, its one of those pick up trucks that serves as a taxi – you’ve likely seen them all over Thailand if you’ve visited anywhere else before going to Chiang Mai. You’ll find songthaews nearby most of the gates in Old Town Chiang Mai. 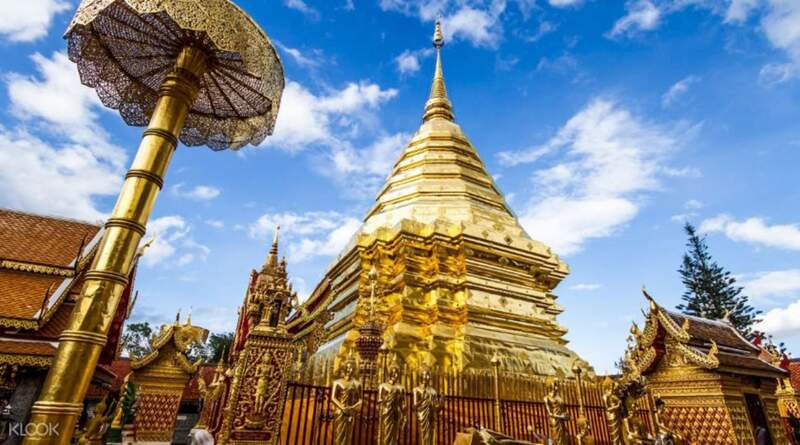 Doi Suthep is actually a big hill located just outside Chiang Mai, which is one of the most popular Chiang Mai tourist attractions. From the top of the hill of Doi Suthep you’ll get views over Chiang Mai, perfect for a photo op. A list of what to do in Chiang Mai in three days would never be complete if I didn’t mention going to this temple that is one of the holiest Buddhist sites in Thailand. 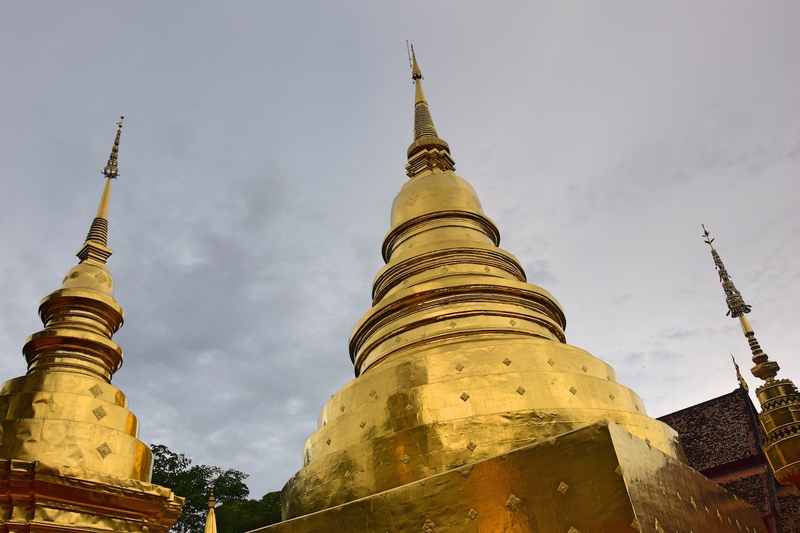 The golden chedi is also pretty impressive, and makes for beautiful photos. Keep in mind the road up to Doi Suthep gets pretty windy, so if you get car sick you might want to know that ahead of time! Yes, you read that correctly. And no, I’m not crazy! If you’ve traveled at all in South East Asia you know how cheap the massages are here, and Chiang Mai is of course no exception. What is unique about Chiang Mai is that there are tons of massage salons where you can get a massage from an ex-(female) prisoner. You’ll see them all over Chiang Mai, with signs outside that say Lila Thai Women’s Massage Center by Ex-Prisoners. These centers were developed to provide vocational rehabilitation for women who may have little monetary resources when they leave prison. I got a massage at one of these locations in Chiang Mai, and it was fantastic. If you can afford multiple massages during one trip, my motto is always to go for as many as possible! Getting the massage, you’d have no idea that these ladies are ex-prisoners, this place is just like any other massage salon, where you’ll be doted on and end the massage fully relaxed. Massages here are very affordable – expect to pay about $20 for a full body, 60 minute massage. You don’t need to make an appointment – just drop in and they’ll more than likely have space for you. I can’t think of any better way to relax during 3 days in Chiang Mai! 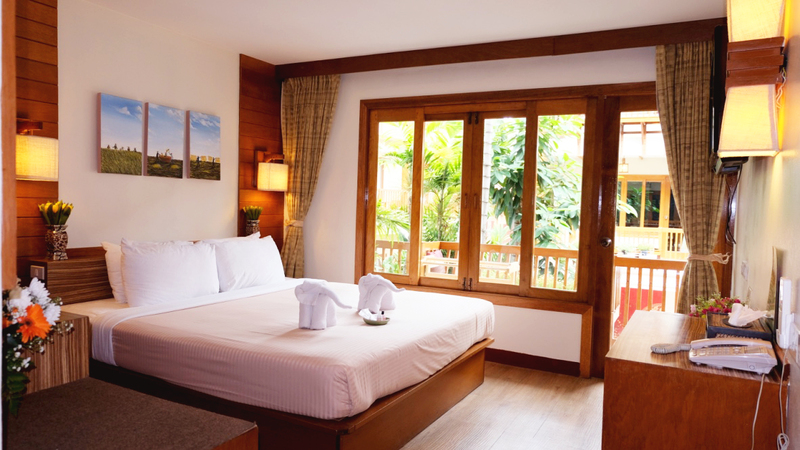 Since you’ll be staying at Vieng Mantra (duh, that is my recommendation! ), head for an easy meal across the street at Lert Ros, where you’ll get some of the best street food around. What better way to round out your 3 day Chiang Mai itinerary than to eat some (more) delicious Thai food cooked up on the street by a local family – I can’t think of any better send off! 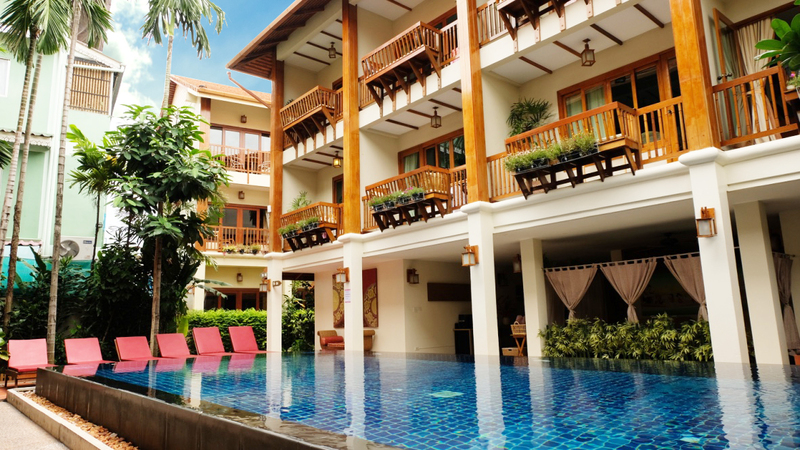 When I visited Chiang Mai I stayed at Vieng Mantra hotel, which is one of the highest rated hotels in Chiang Mai, conveniently located in the Old Town. From Vieng Mantra you’ll be able to walk everywhere that I mentioned on this 3 days in Chiang Mai itinerary (except for Doi Suthep), which I think makes it an ideal place to stay, since I always love to walk everywhere when I’m on a trip. Well, this really depends on where you’re coming from. The easiest way to get to Chiang Mai is by air, since the airport is so close to the old town of Chiang Mai. You can also take a sleeper train from Bangkok. If you’re not sure the best way to get to Chiang Mai from where you are, I suggest checking out 12go.asia – this is one of the best websites to use while planning your travel around Thailand, and in many other parts of South East Asia. 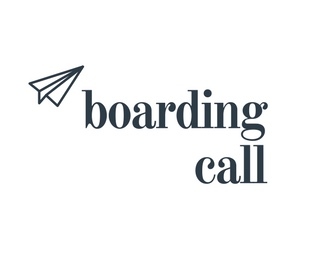 Using this website you’ll be able to combine flights, buses and boat rides, making it very comprehensive and user friendly, especially if you are a first time visitor who might not know how to find your way around Thailand. If you’re traveling through Thailand, there are a few things that you’re gonna need to make sure you have with you, in my humble opinion! 2. Sun block. Ok, you had to know that was coming after the bug spray, right? Who am I, your mom? Yeesh, I know I’m stating the obvious here, but you really don’t wanna get a sunburn in the tropics. You just don’t. 3. Baby wipes. You never know when these are gonna come in handy… and trust me, they will. Even if you just need them to wipe off your sweat in this ultra humid climate, you’ll be glad you have them. 4. A GoPro: Cause you’ve gotta capture your adventure, and a DSLR is heavy… trust me I’ve traveled all over the world with mine and it gives me back pain! 5. Bar Shampoo: Shampoo bars are both good for the environment (no single use plastics here! ), and they are so much lighter to carry with you than liquid shampoo. 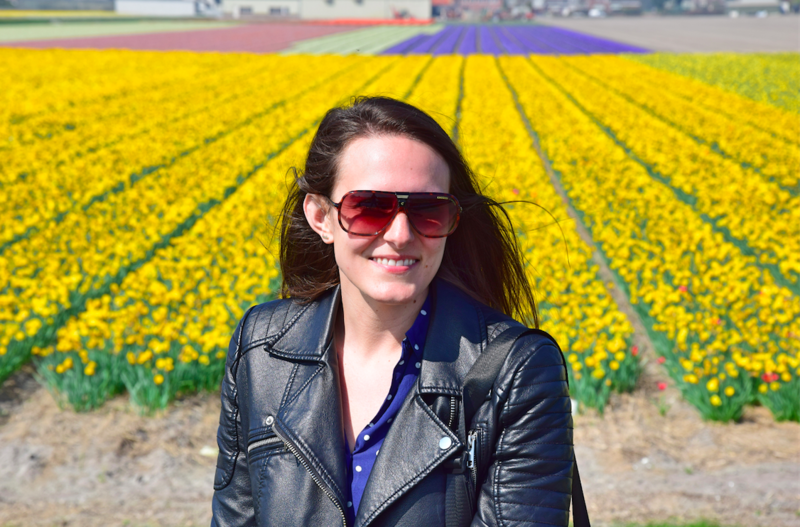 Ladies, don’t worry – I’ve used bar shampoos for months at a time, and my hair was still as silky and soft as ever! 6. PacSafe: This portable safe is one of my essentials – get a size where you can fit all your valuables in it – it is worth traveling with. In many hotels in Thailand I didn’t trust the safe (I had a super fun experience when one wouldn’t open and it had my passport in it…), so do yourself a favor and bring your own safe with you! These bags are reinforced with a steel net lining, so thieves are unable to cut through it. 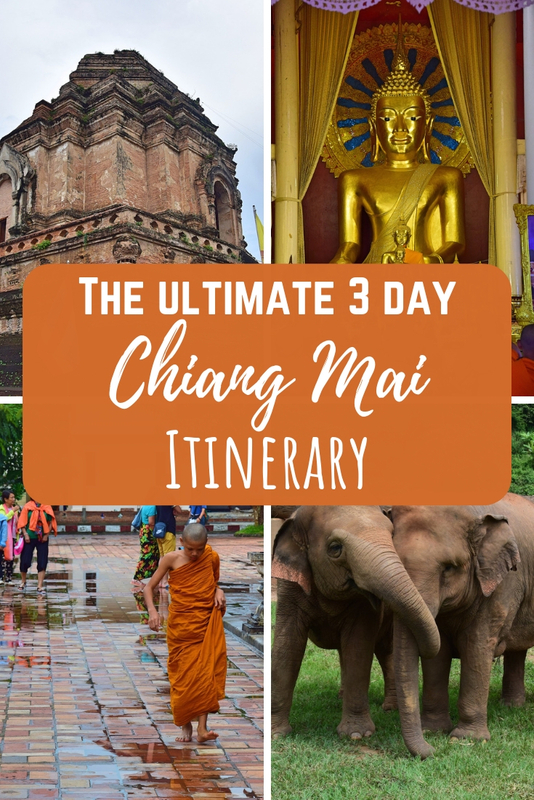 Did this help you plan your Chiang Mai itinerary in 3 days? Let me know in the comments below!